The sliding door will be as manufactured by 3rd Generation Doors. 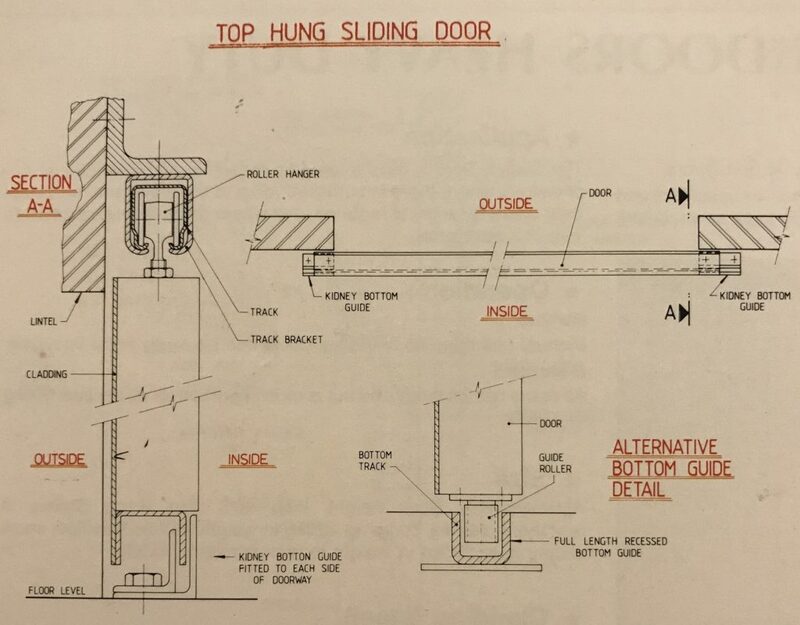 The door will be a single or multiple leafed door (as specified) and will operate using a (top hung or bottom rolling track as specified) and designed to carry the door weight. The sliding door is mostly used on industrial and commercial applications where there is sufficient room at the sides and maximum door opening height is required, and where the door will not interfere with the work area. Manual operation up to 600kg, doors can be easily hand operated. All doors can be motorised but is recommended for doors over 600kg in weight. Approximately Door weight 15kg M/S. top hung sliding is recommended for doors up 220kg in weight and bottom floor track sliding over 220kg in weight to approximately 1,000kg. Door can be either partly or fully glazed to provide light, give inspection windows or full showroom and retail display. Standard glazing of door is 6.32 laminated safety glass set in high security aluminium glazing beads fixed to tubular frame. 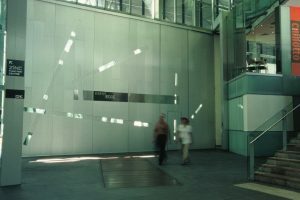 Glazing of doors are to Australian Standards and Specifications AS1288 PART 1-3, 1979. 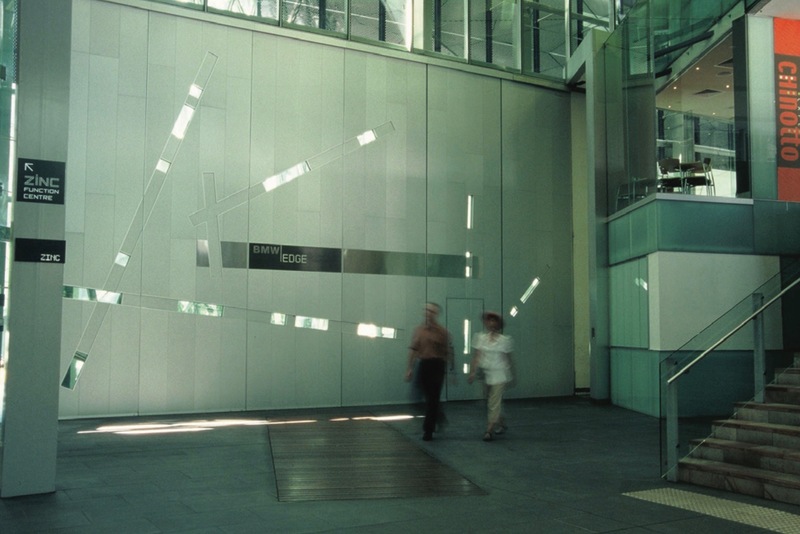 Heavier grades or ornamental glass should not be specified before consulting the manufacturer due to additional weight, deflection and door design involved. Fully glazed doors are fitted with a steel kick plate having a minimum height of 200mm as standard and increasing in height as a structural ember to avoid deflection in the closed position in accordance with door width. The Bar Grille will be constructed using 20mm square rolled hollow steel section tube welded to the door frame face vertically over the entire area at approximately 120mm spacing. The door will be prime coated using zinc chromate primer (or otherwise specified). Door frame work is constructed using rolled hollow steel tube members, braced as required and designed in accordance with the Australian standards to withstand wind loadings in the closed position. Locking will be by means of a hasp and staple or a long shoot pad bolt with provision for padlocking. (Pad Locks by others). The lock will be fixed to one side of the door. Top Hung sliding doors will be fitted with 2 - 4 ball bearing rollers being adjustable in height. The rollers will roll smoothly with a galvanised steel roll formed track fixed above door head. 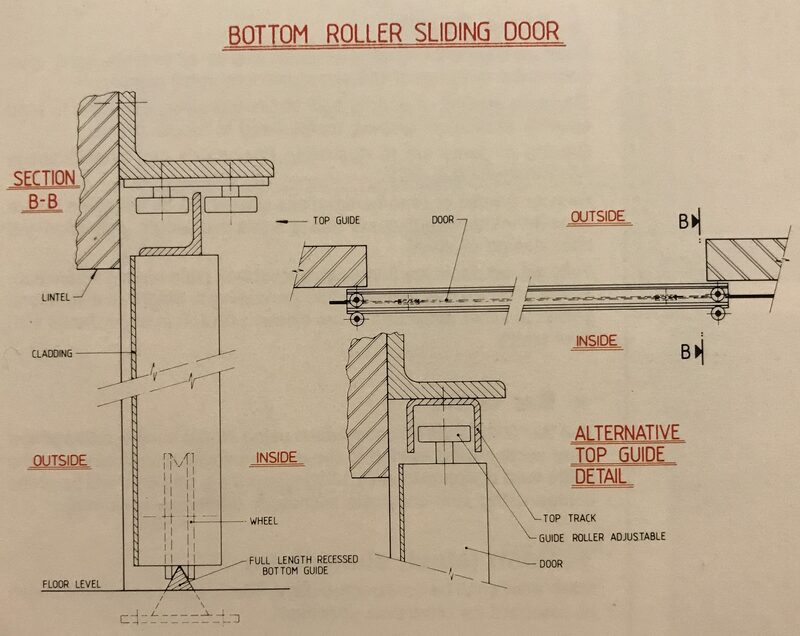 The bottom of the door will be guided by means of (1) a Continuous "U" recessed in concrete floor, and guided by rollers fitted to the bottom edge of door. Or (2) Continuous "U" channel fixed to the bottom edge of door and by kidney type guides, one fixed to each end of the doorway on the floor. NOTE: It is the responsibility of the builder/designer to provide significant strength to the building structure to carry the door weight. Bottom track sliding door will be fitted with 2 fully machined steel wheel having heavy duty double row prepackaged ball bearings and grooved to run on recessed track. The top of the door will be fitted with 2 ball bearing rollers adjustable in height running in a Continuous "U" track fixed above door head. The floor track will be a continuous length and of the ' shape to match the rollers, recessed, (level) into the concrete floor. Operation is by a heavy duty trolley type endless chain drive system driven by (optional) 3 phase 415 volt or single phase 240 volt motor. The door operating speed will be approximately 9 meters per minute. Optional remote control can be fitted. Note:3rd Generation Doors reserves the right to make without notification such alterations in design and manufacture as deemed necessary in line with our policy of continual product improvement.